Today I thought I would tell you how I’m EASILY investing in women-led companies this year, and how you can too even if you don’t have a lot of money to invest. For a couple of years now I’ve been using a company called Ellevest to manage my investment portfolio. When I first heard of them I was eager to sign up because they are an investment firm focused on women’s needs. What does that mean exactly? 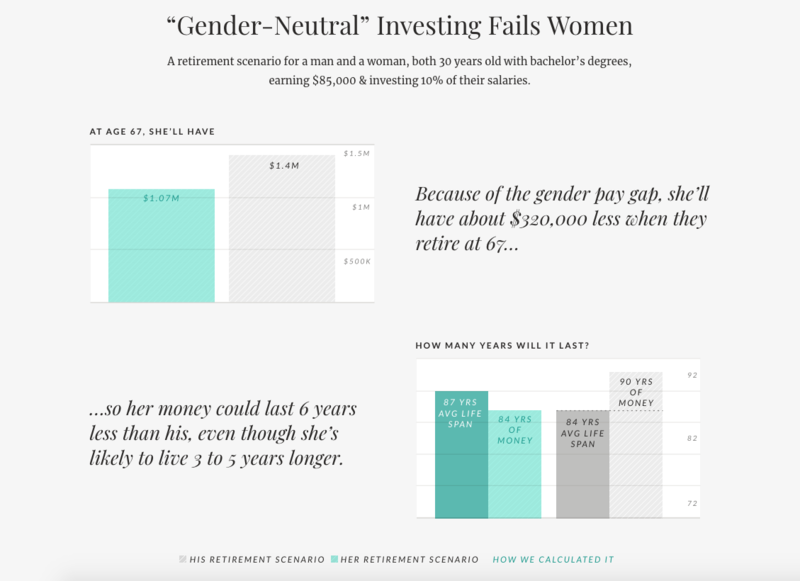 Well, Ellevest takes into account that women tend to have longer lifespans, different salary trends and the possibility of extended time off work (for pregnancies and such). You can read more about why personalized portfolios for women matters here on their site. I’ve included a screenshot of the things that jump out most to me. The jist is because of the gender pay gap (and things like unpaid maternity leave), we’ll likely make less than men and have less to invest, and yet we tend to live longer and thus need more money. Ellevest comes in because they advise and manage your portfolio in a way to help you, as a woman, achieve your goals. 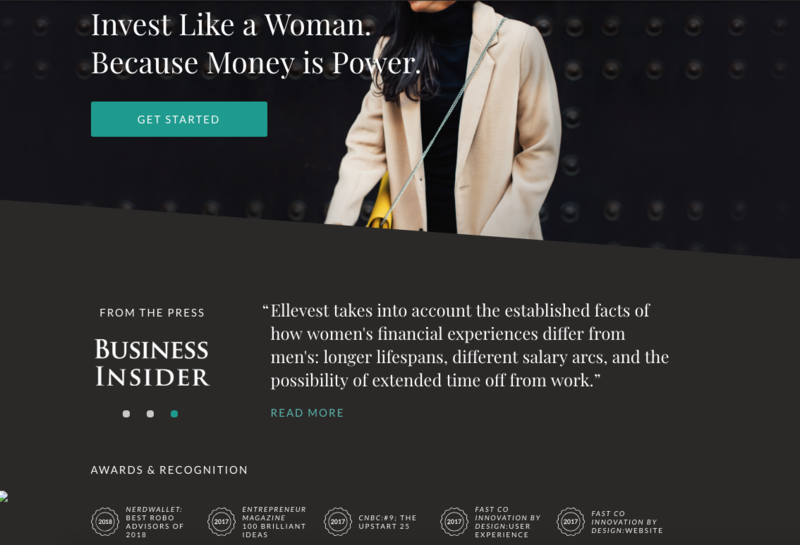 Another thing I like about Ellevest is that it’s a woman-led company and now they are making it easy to invest in women-led companies while still staying on track to meet your financial targets. They call this feature Impact Investing and what it means is if you choose this option they will invest up to half your money into companies with women leaders and policies that advance women. Additionally, they will invest your money in companies that meet higher standards for sustainability and ethical practices. 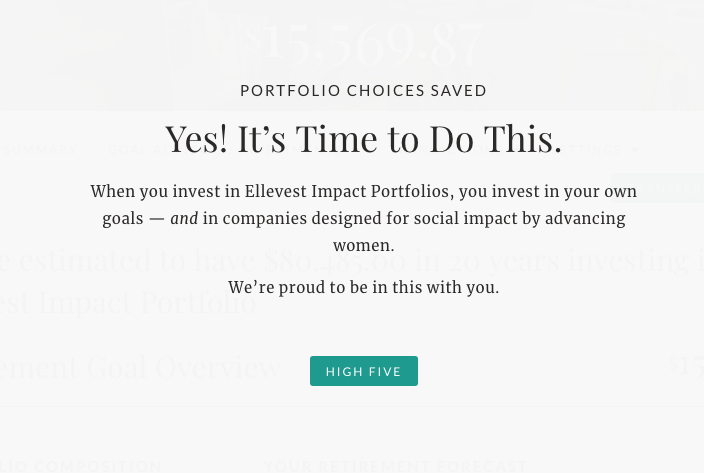 With just a couple clicks of a button I was able to change my investment strategy with Ellevest to include Impact Investing, and there was nothing else I had to do on my part. Since I started investing with Ellevest a couple of years ago I’ve seen nothing but positive returns, unlike my 401K which tends to fluctuate. One great thing about Ellevest is that you can start investing with just $1 or whatever you have. Although you don’t have to start with just $1 you can start with $100 dollars because I have special invites that give $100 to give to 5 friends interested in joining Ellevest. You can start and then ramp up your investing at whatever pace you’re comfortable with. I think I initially started with a $200 deposit just to see what it was like, and now I have quite a bit of money with them. This isn’t a sponsored post or anything. 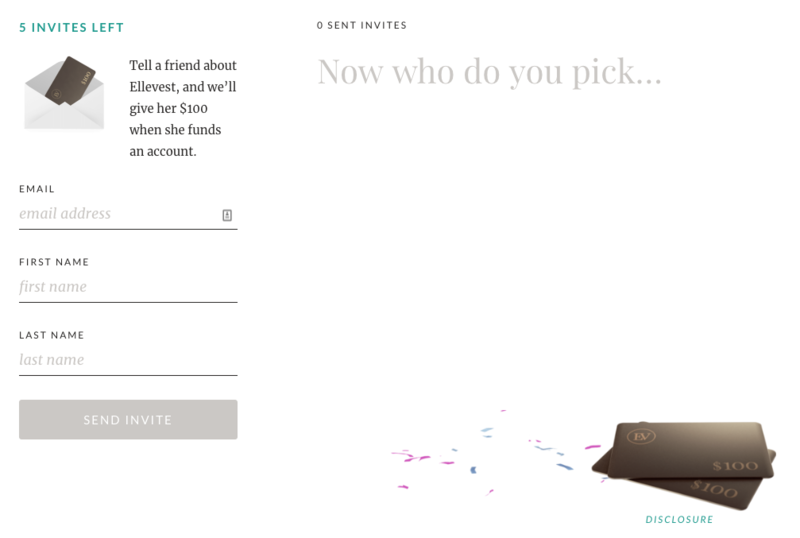 Anyone who uses Ellevest gets these referral invites, and I decided since I was going to write this post I might as well pass along the invite to anyone interested. I don’t benefit financially or otherwise from giving out the invites. So, if you’d like an invite just leave a comment or send me a DM and I’ll send you one. This year a big focus of mine is to be more financially savvy and to expand my investments. I by no means have millions of dollars to invest but hopefully I’ll have millions of dollars at the end haha. If you’re interested in hearing more about what I do to invest money this year let me know by clicking the heart button below. Otherwise I’ll consider this a boring topic! Oh, and they do have a direct deposit feature so that you can link your bank account and automatically invest more each month; there’s no minimum for how much you have to direct deposit. I currently only direct deposit $100 per month, but then quarterly I make larger one-time deposits/transfers from my savings account since I make a much higher return from Ellevest than my savings account. You can also take money out of your investment portfolio at any time if necessary. If you have any questions just drop me a comment below! *Disclaimer: I don’t have all my money with Ellevest, I have a 401K, etc outside of the company. Previous Post May Running Check-In! Very interesting. How did you hear about Ellavest? Would you consider it a low risk investment? Hmm I can’t remember exactly where I heard about them. It might have been TechCrunch since I used to follow that blog a while ago when I was really interested in learning about new tech startups. The risk is really dependent on your goals. When you sign up you tell them a bit about your situation like how old you are, how much you make, how much you have in other investment accounts and what year you plan to retire. Based on that information they may be more or less aggressive, similar to other investment firms. If you invest 50K or above with them you will get a financial advisor who can work with you on a custom plan, otherwise it’s mostly all automated through the website. Although they have a great support team that includes financial advisors as well. I’ve always gotten a fast response through their support team! This sounds really great! I’m reading this a few days late, so I don’t know if you’ve already sent out your referral invites, but I’m definitely interested if you still have one! Considering my profession (CPA), I really should be more involved in my own financial planning! I’m good about putting money into my 401(k), but not much beyond that.